ARE privately owned accounts from EBAY,AMAZON AND VARIOUS OTHER SECOND HAND WEBSITES AUTHORIZED VENDORS OF AVOLOGI SCIENTIFIC MEDICAL DEVICES? NO. The only online website that is authorized is avologi scientific official website and through avologi scientific accounts. Any items for sale elsewhere online have not come directly from the manufacturer. Therefore, we cannot guarentee it's authnicity , condition, or if it has been damaged or used. You will make the purchase at your own responsibility and the lifetime warranty is null and void. 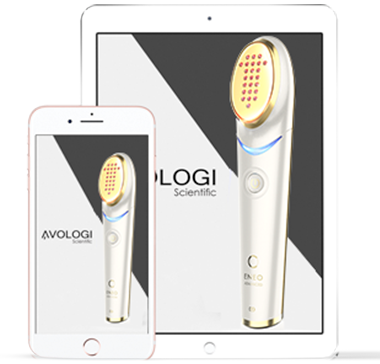 Please purchase only from avologi scientific official website or authorized retail vendors. Is red light therapy similar to sunbathing? Although sunbathing does produce a feeling of wellbeing in an individual and is vital for the creation of Vitamin D, there is a large difference between the light coming from the sun and the light that is coming from a red light treatment. There is no risk of sunburn when treating with red light, since there are no UVA or UVB rays in red light therapy. The treatment will brighten skin tone and improve texture, helping to reduce pore size. Anti-aging red light increases circulation and heals the elastic fibers that help keep skin young and tight. Is red light therapy similar to laser treatments? Red light therapy does not hold the potential for damage as with laser treatments. These treatments Red light therapy is one of the cannot cut or scar the skin. Red few non-invasive technologies out light therapy differs from lasers in there available that can reverse the that the concentrated light that is appearance of aging skin. used to vaporize or remove tissue. In general, the best results will be seen in an 8 to 12 week period, or over a period of several months. Can red light treat cellulite? Although there are no studies supporting that cellulite is treatable with red light therapy, it can be used during detox to accelerate the process. This is due to the healing activity that is already taking place during a fast or other cleanse. When paired with red light therapy, the effects are phenomenal for weight loss, which can be linked to reduced. Does red light therapy treat acne, age spots and weathered skin? Yes, Blue led lights are excellent for removal of bacteria that is responsible for acne and other skin conditions. Red led lights reduces the appearance of aged skin and is known to brighten the skin and reduce the chances of skin discoloration occurring. NO. Red light treatments never hurt. Unlike lasers or microdermabrasion, which makes use of abrasion to change the skin’s appearance, these treatments only use light. Users do not report discomfort during treatments. The skin may feel warm due to the intensity of the red light treatment. When red light energy at 633nm is absorbed at a cellular level the production of this energy means cell vitality and permeability is increased overall. Production of new collagen, and increased turnover of collagen and elastin occurs during this process, ensuring that the fibers within skin are firm. Scientific studies have also shown that cells grow 150200% faster upon exposure to certain light wavelengths. Is our red light treatment safe? YES. Red light therapy is completely safe for an average healthy individual. According to the FDA, red light used at 633 nm poses a non-significant risk and is also safe for the eyes at that level. Red light goes into the tissue at a depth of 8-10 mm, ensuring that the level of delivery is not only safe but also effective. The results are long lasting. Results can depend on the type and length of treatment. Skin treatments are a dynamic process. Continued treatments are needed for wrinkles and expression lines to stay at bay. Is the effect same for all skin types? Red light therapy is safe and effective for all skin types and pigmentation. The sole requirement is that skin is clean for effective light transmission. Oils and other debris that may build up on the skin during the day will interfere with the light and lessen its effects. Remember, the light needs to deeply penetrate the skin for enhanced cellular healing. RENELIF perfectly combines advanced technology of dermal heat and INFRARED Fractional Light to safely reach and treat multiple skin layers. The light and heat are precisely combined to help stimulate collagen to reduce appearance of fine lines and wrinkles and to improve overall skin texture. When you glide the RENELIF along your face, the red Light Emitting Diodes (LED) will automatically turn on upon contact with your skin and the temperature will slowly increase. The RENELIF will warm your skin to the perfect temperature that allows the INFRARED fractional light therapy to stimulate multiple layers of your skin for a total solution. RENELIF is a professional anti-aging FDA cleared medical device that provides immediate and long-term skin rejuvenation results. This anti-aging device is used for skin tightening, wrinkle reduction, and improved skin texture in the comfort of your own home. What is Collagen and Elastin fibers? Collagen and elastin fibers are essential components of the skin which gives your skin shape, lift and support. The collagen fibers are responsible for skin strength and tone. The elastin fibers allow skin flexibility or elasticity. As we grow older, our Collagen and Elastin regeneration slows down. RENELIF technology helps stimulate the natural production of new collagen and elastin formation. Is RENELIF safe to use? Yes. RENELIF is clinically tested, FDA approved device and is recommended by leading dermatologists around the world. Can the RENELIF be used by men too? Absolutely. RENELIF is intended for safe and effective use on both men and women. RENELIF treatments are completely painless because RENELIF INFRARED fractional light focuses the energy delivery directly into the dermis, which is the lower layer of your skin. RENELIF treatments give you a pleasant, warm sensation. For a few minutes after treatment, most users will experience a slight redness in the treated area. This may linger for a few hours but is no cause for concern. If at any time during treatment your RENELIF feels too hot for your skin or your skin feels irritated, stop treatment for a few minutes and allow your skin to cool down before resuming. Has the RENELIF been dermatologist-tested? Yes. The RENELIF is a revolutionary home skin treatment that uses professional dermal heat and INFRARED Deep Fractional Light technology that has already been proven in tens of thousands of skin tightening treatments performed by dermatologists worldwide. Can I use the RENELIF if I’m sunburned? RENELIF can be used on suntanned skin. However, if you have a sunburn and your skin is red and sensitive, avoid treatment with RENELIF until the redness and sensitivity have disappeared. RENELIF must not be used if you have sores, blisters or any abnormal skin condition. We suggest that anyone who suffers from any specific skin disorder on the face should consult their dermatologist before using the RENELIF device. Should I stay out of the sun after using the RENELIF? It is always recommended that you protect your skin when you go out in the sun. The RENELIF treatment will not make your skin more photosensitive than it already is, so this should not greatly impact your determination whether or not to go out into the sun. However, as over-exposure to sunlight can contribute to skin laxity, remember to be cautious in the sun and protect your skin. Why is RENELIF different than creams? Cosmetic skincare products are most effective at working on the epidermis, the outer layers of skin. RENELIF, however, penetrates energy deep into the dermal layers of the skin where new collagen and elastin fibers actually form and stimulates for natural production of new fibers. Meaning it will help the cosmetic products you use perform more effectively. How often can I use the RENELIF? In order to maximize the treatment results with RENELIF, it is recommended you perform a full treatment 3 times a week for a period of 1 month. After the end of the first month, we recommend continue maintenance treatments on the area of your most concern up to 3 times a week. Can I use the RENELIF around my eye area? RENELIF is recommended for use around the eyes (over the orbital bone). Do not use the device over your eyes, across your eyelids or any closer to your eyes than the limits of your orbital bone. What is the noise I hear when using the device? RENELIF has a built-in real-time thermal control chip that keeps the treatment temperature steady at 41oC/106oF. During the treatment, you may occasionally hear a noise of the thermal fan which cools the area and keeps the RENELIF from exceeding treatment temperature. Why the fractional treatment LEDs are turned on only when in contact with the skin? RENELIF is designed with a safety chip to prevent the fractional Infrared light to come in direct contact with the eyes, therefore, red Light Emitting Diodes (LED) will automatically turn on upon contact with your skin.